To help reduce stress why not practice being mindful now by using this useful training video, and then if you have any questions about mindfulness, stress, pain and your condition please email us on LiveChat@sruk.co.uk and we'll be in touch with a specialist to give you an answer. Stress can feel overwhelming or when it goes on for too long can affect relationships, work and home life. Your mood and behaviour might change, and you might notice physical clues within yourself that all is not well. Although stress itself isn't a psychiatric diagnosis, it can have a harmful effect on our emotional and physical well-being. It can even lead to serious illness in some cases Raynaud's, or certainly a Raynaud's attack. A certain amount of stress can be positive and motivating. Can you explain to me what happens in my body when I get stressed because of my Raynaud's? When we are stressed, the hypothalamus part of our brain tells our body to make more “stress hormones," such as adrenaline and cortisol. These hormones give us an extra boost of energy so that we can deal better with any threats or pressure (also called our fight or flight response). Adrenaline, for example, increases our heart rate, raises our blood pressure and provides energy, and cortisol increases our energy by releasing glucose into our bloodstream so that we can run away. Our body usually controls our physical response to stress all by itself, so that when the stressful event is over, our hormone levels naturally fall. Problems occur, though, when our stress is too intense or goes on too long, because our bodies are forced to release stress hormones over a long period. I don't fully understand what mindfulness is, please could you explain again. Mindfulness is a mental training technique that teaches us to be aware of our thoughts, feelings, moods and bodily sensations as they are in the present moment so that we can see things as they are, and not as we wish them to be. When we pay attention to how we are thinking and feeling right now, we become better at spotting the build up of stress – and uncomfortable emotions and thoughts – so that we can deal with them more effectively, instead of just reacting in ways that might not be good for us. We learn that thoughts are just thoughts. How can mindfulness help my pain and Raynaud's? You can start with a small exercise to figure out what exactly is giving you pain. It can help to sit down and write the answers to these questions: What makes me feel pain? Think about large and small triggers, since even something that seems trivial can spark a pain spiral. Examples of small triggers might be going outside in the cold, chopping cold vegetables, or drinking a cold drink. What thoughts and emotions arise when I begin to feel pain? What is happening in my body when I begin to feel pain? Know the answers to these questions will help you to feel more in control and better equipped to manage your Raynaud's attacks. What can I do to help manage pain? There are lots of positive things that you can do that will give you the strength and wisdom to deal with challenges from Scleroderma or Raynaud's. The following suggestions will help to make you feel stronger and more in control on a day-to-day level so that you hopefully become more prepared to face the pain in your life. Learn what supports and sustains you. Many people lead life on automatic pilot, rarely stopping to ask themselves what supports and sustains them. Make a list of all the things you do in a typical day and then highlight those that have a positive impact on your life and then those that deplete and exhaust you. Are there any changes you need to make? Because our minds tend to focus on threats and problems, we often ignore all the good things in our lives. It can be helpful to pause regularly to think about three things that you enjoyed, that went well, or that you are grateful for – they can be large or small. Writing them down can be a good reminder that it might not be all bad. It can also highlight what is important to you and what you enjoy. Take control: planning, problem solving and time management. Being passive can make our problems seem worse. Managing your time better in your work and personal life can be very empowering and make you feel more relaxed and focused. Managing your time can include: Figuring out your short, medium and long-term goals so that you have a road map for the future however small they may be. Writing a single daily to-do list (not multiple lists which can get confusing) can help you remember large and small tasks, and when you need to do them. Having a to-do list frees the mind up from the stress of always worrying that you are forgetting things. Scheduling in time for breaks, exercise, meals and leisure activities so that you give yourself the best chance of staying refreshed, happy and healthy. Working “smart" not more. Working an extra hour when you are too exhausted to focus, for example, might not be a good way to manage your time. which can lead to brining on a Raynaud's attack. Prioritising important tasks that will fulfil your goals. It is all too tempting to “clear the decks" by doing small tasks that are not important, such as clearing non-urgent emails. Socialising and communicating with others. Having a good support system of family, friends and colleagues already in place during the good times means that we will have people to turn to in the bad times. They can provide a listening ear, give us a new perspective to our problems, and encourage us to try new things and get out more. Identify and avoid unhealthy habits. We can all have habits that we do for good reason, but some of them probably make things worse. Some classic ways of reacting to stress are comfort eating, turning to caffeine, alcohol, smoking, irritability with others and/or drugs. None of these strategies will solve our problems, of course, and some could cause additional ones but at least we have a plan. Sarah Leggett and Dr Oliver Wilkinson presented on 'Coping with your condition and mindfulness' at our 2016 Annual Conference. 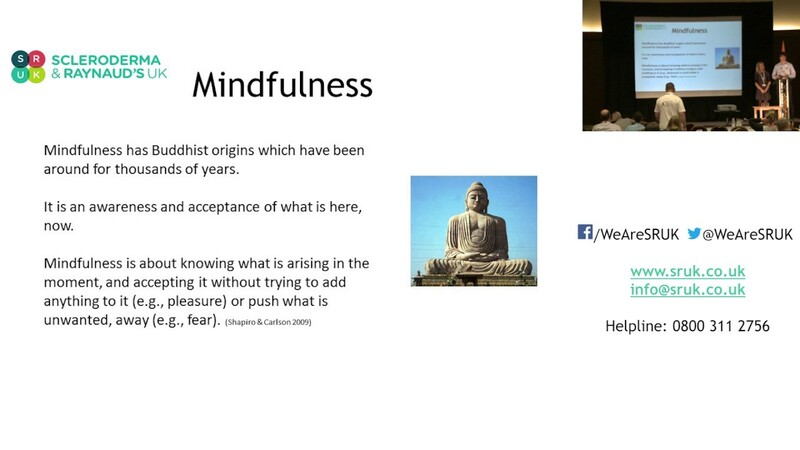 You can watch their presentation below to learn more about the technique of mindfulness and how it can help you to better manage your condition.